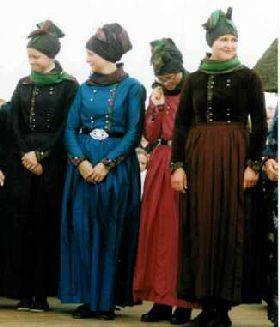 Women dressed in their fine Fanø dresses. Fonden Gamle Sønderho owns a dress collection which were used as the daily clothing by the women until the 1950th. The dresses are today used at Sønderhodag, and they can be lent for weddings, confirmations and other festive occations. The first woman wears a fine Sunday dress made of black silk with cotton head and neck scarfs. The second and third women wear silk festivity dresses and silk scarfs. The fourth woman wears a fine Sunday dress consisting of a velour top called “nattrøje” and a silk aprin. She wears cotton head and neck scarfs. The four dresses has silver buttons and embroidered rose ribbons. The two festivity customs has belt with silver buckle. Under the aprons the women wears cutton pleated skirts. Click below to see photos and description of the dress collection. See more about the Fanø dresses here. 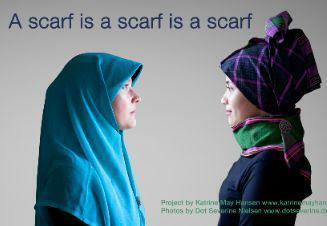 In 2015 a thought-provoking exhibition was opened in Fanø Kunstmuseum about the old head scarfs.